This self-portrait was written by the artist in 1628. Recently, returning from Amsterdam, where he studied with the painter Peter Lastman, the artist sets up his own workshop and decides on the recruitment of students. Young Rembrandt Harmens van Rijn is full of hopes and expectations. 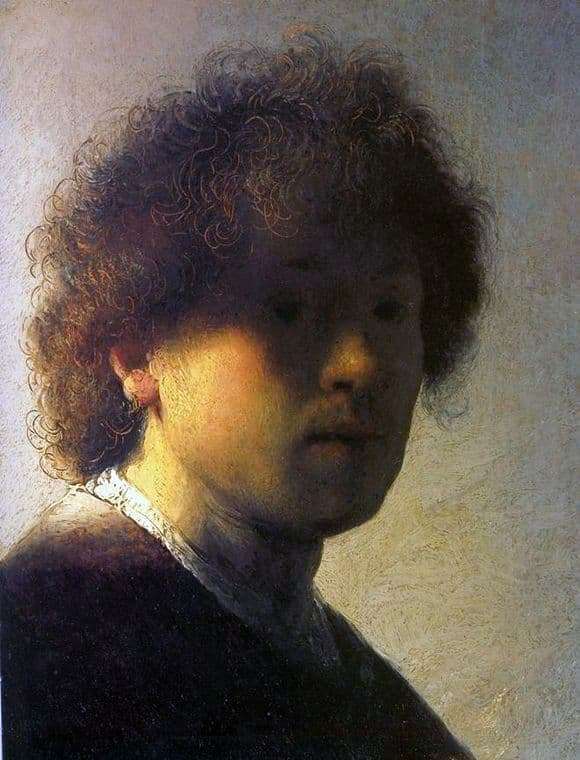 All self-portraits by Rembrandt are very sincere and believable. At the age of twenty-two, the young man looks somewhat insecure and alarmed. Curly hair, a lively blush on the face, an interested look, testify to the romantic nature. The shadow falling on the face adds mystery and integrity to the portrait. Looking at himself in the mirror, the artist transfers to the canvas not only his appearance, but also the internal state of consciousness, hidden even from himself. Anxiety, uncertainty and fear of the future are inherent in most creative young people. Maybe he is not sure about his own talent? The result of his works of knowledge of artistic skill will show time. Rembrandt is looking for his original and recognizable writing style.